Is Waterproof Plywood Myth or Fact? Plywood is a building material that is widely used in the interior, exterior, structural and marine applications in construction field. The product is an assembly of wood veneers which is bonded together by means of an adhesive that will result in a flat plywood sheet which is available in market in various thickness. The product is factory made and comes in specific dimensions and has specific properties. Normally Plywood does not undergo any sort of warping or cracking during variation in atmospheric moisture. However, a question which often arises is its use when there is water or excessive moisture. There is a major concern with plywood, that is its lower resistance to moisture attack. By default, waterproof plywood is a myth. The presence of moisture will result in swelling and development of cracks in plywood. 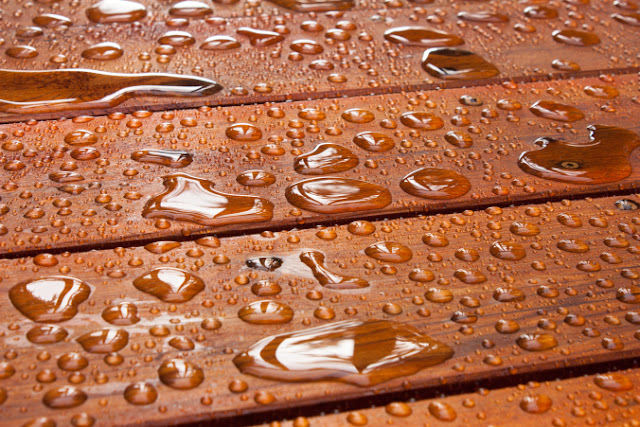 Some plywood will undergo discolouration when subjected to moisture or water attack. The adhesives that are used to bind the veneers in order to manufacture the plywood sheets are the main factor that contributes high moisture resistance. However, the resistance can be increased by providing additional painting or varnishing or by applying laminates &or face veneers sheet. This specially prepared plywood hence can be used in the construction of sheds, marine construction, cladding etc mainly for the exterior purpose. Different plywood grades are mainly made during their manufacturing process. These grades differ by the variation in the type and properties of adhesive used in their making and its capacity to resist the moisture. This difference of the adhesive can manufacture various grades that are suitable for various applications. Note: The ability of a product to resist the penetration of water to some extent is called as water-resistant property of plywood. The property of the plywood to behave completely impervious to water is called as waterproof property. The MR grade plywood known as“Moisture Resistant Grade Plywood”. This is moisture resistant, that means it has the property to resist the moisture and humidity condition. This is not a waterproof plywood. Based on this property, it is widely used in the application of interior furnishings and building works. The resin used as adhesive in the manufacture of MR grade plywood is urea formaldehyde. The BWP grade is “Boiling Water Resistant Grade Plywood” that is used for exterior and indoor grade plywood construction. This will resist water when compared with the above-mentioned MR grade plywood and is costlier than MRgrade plywood. The plywood used in furnishing of kitchen cabinets is prone to moisture due to prolonged use. Hence BWR plywood is best for making furniture that has chances to get wet. BWR grade plywood uses phenol formaldehyde as adhesive in their making. This phenolic resin imparts water resisting properties to the BWR plywood grade. This is used in indoor and outdoor furniture, office and kitchen cabinets and furniture. This is “Boiling Water Proof Grade Plywood”. This is also called as Marine Plywood which is completely water proof. These are used in areas where there is direct exposure to water body. This plywood is impervious and used in exterior applications. BWP Grade is best applied in Marine construction. There is different BWP type plywood available that varies based on the resin used by different manufacturers. Note: The BWR grade is lower than BWP grade. BWP is used where direct contact of water is expected. The moisture penetration property of plywood will also help in holding the concrete until the mix sets when used as a formwork. The plywood can be laminated across the laying direction to avoid expansion, warping or shrinking when it is exposed to water and moisture conditions. Waterproof plywood will prevent the attack of microbial decay. Some of the plywood types are made waterproof during their manufacture itself as discussed above. Different grades based on the method of manufacture and materials used are available in the market. But normal plywood can be made water proof by some easy methods. 01. Application of water proof paint: Based on the use of plywood the application method will vary. Waterproofing can either be done through spray on or paint on method. The materials used are penetrating oils, sealers, epoxy sealants and liquid latex. 02. The liquid can be applied by means of brush or roller. But one has to be careful to equally apply paint on all six faces of plywood. 03. Application of paint is performed on a clean surface of the plywood. The paints will help fill the cracks and depressions over the surface. The presence of any other paints or stains has to be removed before painting. 04. Based on the purpose of the plywood, the number of paint layers applied may vary. For instance kitchen cabinets, the plywood should be painted in two coats. 05. Sometimes for long life, the plywood has to be painted at the end of each service year. 06. Stronger is the adhesive used in manufacture of plywood, higher is the water resistance. This means the waterproof property of the plywood is because of the adhesive and not plywood alone. 07. To check the plywood sheets, submerge the plywood in boiling water for 72 hours will help to know the water resistance and hence the quality of the plywood. Painting and application of different water proofing and water resistant sealants and paints are one of the commonly used plywood protection procedures followed. These are applied for different grades of water proof plywood also. The inbuilt property of waterproofing in plywood is gained by the adhesive that is used in the making of plywood. These adhesives make plywood behave watertight under the action of moisture or water. The test is applicable for plywood, hardboards, and medium density fiberboard. The test involves determination of water absorbed by the panel within a specific standard time through the surface of the panel product. The test measures the amount of water absorbed when the product is exposed to standing water. In conclusion, Manufactured plywood are not directly waterproof. They are actually water resistant depending upon the adhesive used for manufacturing the particular grade. Plywood: All You Would Like to Know!